​Four members of SWE-ECI attended the University of Iowa’s High School Conference on April 5th. The High School Conference allows high school students to visit the college and explore what it’s like to study engineering. The professional SWE members served on a panel and fielded questions about what it’s like to be a professional engineer and what college was like. After the panel, dinner was served and the SWE-ECI members mingled with the high schoolers and answered any remaining questions that they had. ​On April 7th, members of SWE-ECI volunteered to staff a booth at the Iowa City Parks and Recreation STEAM Festival. The festival was set up like a street fair and allowed families with children of all ages to go from booth to booth and perform experiments with the various professional societies and businesses in attendance. SWE-ECI hosted a booth with Ozobots. Ozobots are small robots that can be “programmed” by drawing different colored lines and adding patterns to the lines. The Ozobots were a big hit and drew lots of questions from both parents and children. Overall, the SWE-ECI booth had over 100 visitors. On March 28th Integrated DNA Technologies was gracious enough to host a Tour for SWE-ECI. The group learned the history of IDT, the story of its founding and how it has grown over the past 30+ years. We learned that DNA is made up of different variations of T, A, G, and C. We also toured the production and quality labs. Lastly, I would like to extend a special Thank You to Scott Allen for organizing and leading the tour! realizing that we are asking for our worth rather than tooting our own horn while asking for a raise, using industry standards for remuneration in creating a pitch for raise, and practicing confidence while delivering the message. The second talk reiterated on how business, financial and strategic acumen are the essential skills to climb up the ladder, but often overseen as women only tend to get mentoring in soft skills like confidence building. During the discussion round, women shared instances of how they thought their raise was delayed just because they didn’t ask for it earlier and how they will now reshape their mentoring relationships to build on business acumen. The event was a hit with its “aha!” moments and takeaways that’ll help the attendees in a professional capacity. SWE-ECI hosted two events on Saturday, March 23 at the Kirkwood Regional Center in Hiawatha: Senior Girl Scout day, and a K-2 Girl Scout event. This Robotics themed event called "Design Your World" was attended by 55 girls - 7 middle schoolers and 48 girls in Grades K-2. We had 93 people in attendance, about 20 were our volunteers. Demonstrations were done by a local group called SteamOn - which sponsors First Lego League groups and teaches Robotics to different groups in the CRMetro area, and by Brittany GIvens from U of I, who helped the girls make elephant toothpaste!. The younger girls made binary bracelets, walked through a maze like robots, and learned about the Ozobot. The older girls also made a binary keychain (and had to tie their own knots) and then built and programmed Lego Mindstorms robots. Event sponsors include Hyvee, Collins Aerospace, SteamOn, and Girl Scouts. Everyone went home with a Collins drawstring bag, a t-shirt, a toothbrush with SWENext logo on it, and a few more giveaways, and lots of handouts with good info to take home. They also went home full of pizza! One of the really cool things to watch (besides girls having fun!) was the networking our volunteers were able to do in between their mentoring responsibilities. This network of amazing women has so much to share and teach each other. Awesome! Thank you to all who volunteered and provided leadership for this event. Let's do it again next year! SWE-ECI hosted our annual New Year, New You event this past Thursday. For the event Gale Mote came to speak about engaging in productive conflict. She talked about what it takes to make an effective team - Trust, Productive Conflict, Commitment, Accountability, and Results. Gale enlightened the group about the DiSC behavior assessment tool and the group discussed tips on how to ensure we engage all types of personalities when on a team. I personally look forward to utilizing the skills learned on Thursday with my project teams. SWE-ECI would like to extend a special thanks to Gale Mote for coming to speak with the group - she is a delight to have at our events! ​On January 26th, the SWE-ECI chapter sponsored a special award for the Future City Competition in Cedar Rapids, IA. Future City is a competition where middle school students design a city in the future that meet the year’s theme. The theme this year was “Power Our Future”. Teams were challenged to design and build a resilient power grid for their future city that can withstand and quickly recover from the impacts of a natural disaster. The special award hosted by SWE-ECI for “Most Diverse Infrastructure” was awarded to the team that had the greatest variety in shapes, colors, and buildings in their city. This year’s award went to Cienfuegos from Decorah Middle School. Their model was very appealing to the eye, and also had a wide variety of buildings and structures in their city. After the special awards judging, SWE-ECI also helped judge the general model and presentations for the cities. 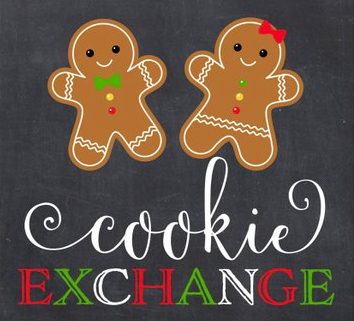 The SWE Cookie Exchange took place on December 20. We had attendees from the professional, collegiate, and high school chapters. The students from Iowa State and North Dakota State shared stories about college, their favorite and least favorite classes, and how they dealt with hard classes. As high school students, we learned that it isn’t uncommon to struggle with a college class (even though most of the people there were straight A students in high school) and college is completely different. Struggling with a college class doesn’t mean you shouldn’t be an engineer but that you have to learn to use your resources. After we talked and exchanged cookies, we toured Crystal Group’s new state of the art facility. It was a relaxed event and a fun way to wrap up 2018. Annually, SWE-ECI treats it's Society Members to an evening of fun and networking. This year the group went to Lion Bridge Brewing Company for an evening of painting monogram signs. It was great to meet new members and truly see how creative this group of ladies are when you give them a paint brush. 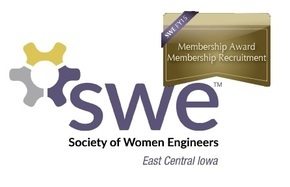 SWE-ECI would like to thank all of our Society Members for continuing to stay involved with SWE! ​On Nov. 17th, the SWE-ECI Section partnered with STEAMOn and the Girl Scouts of Eastern Iowa and Western Illinois to sponsor an event that allowed Girl Scouts to explore engineering and earn their Think Like an Engineer Journey Badge. Girl Scouts were broken out into their levels (Daisies, Brownies, Juniors, Cadettes, Seniors and Ambassadors). Each level was assigned two SWE volunteers who then led the girls through age-appropriate design challenges. The design challenges allowed the girls to get hands-on experience and learn what engineers do in their day to day jobs. The event boasted an attendance of over 250 girls and over 100 parents. The parents had their own full-day session that taught them how to foster their girls’ interest in STEM.